I wasn't sure what I was going to do on my mantel this year for Christmas. I was strolling through Pottery Barn and saw these trees with the lights and then ideas came to me and a scene that you might see in the woods, sans the lighted trees, was created. I used a blanket of snow across the mantel and then placed the trees at each end. I love these trees because the lights have battery packs that run the lights with timers and I just tucked those under the snow. I knew I wanted to place some deer on the mantel and went in search of ones the correct size. I found both of these at an antique mall. I love how life like this one looks and wish there had been a buck like this. I already had the bottle brush trees. I added two little cute bears at each end of the mantel. I added bits of snow on top of the burlap bases of the trees. This vintage Belgian bulb basket that I bought last year from Dreamy Whites holds a thick faux fur throw to grab on a chilly evening. This is Mr. Savvy's favorite throw. 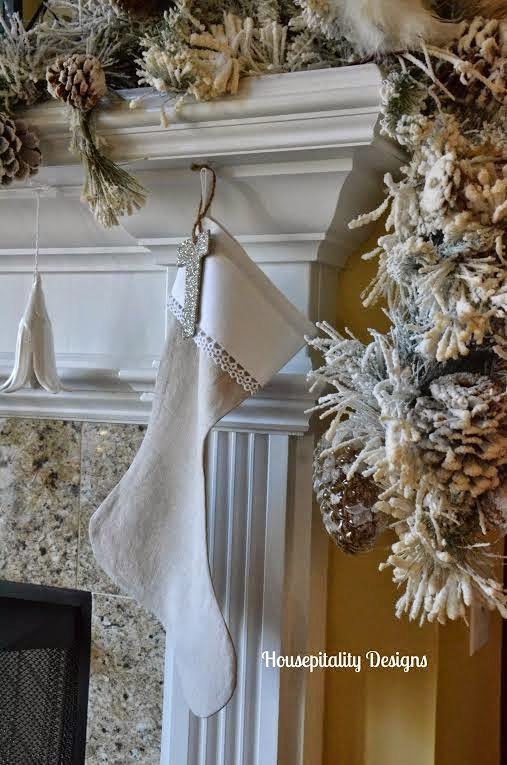 I wanted birch logs in the fireplace this year to go along with the woodland theme and since we don't have birch trees I ordered these from an etsy shop and they came very quickly. After I was finished shooting pics for this post I decided to add these lights to the logs. Do y'all keep tweaking things after you finished like I do? 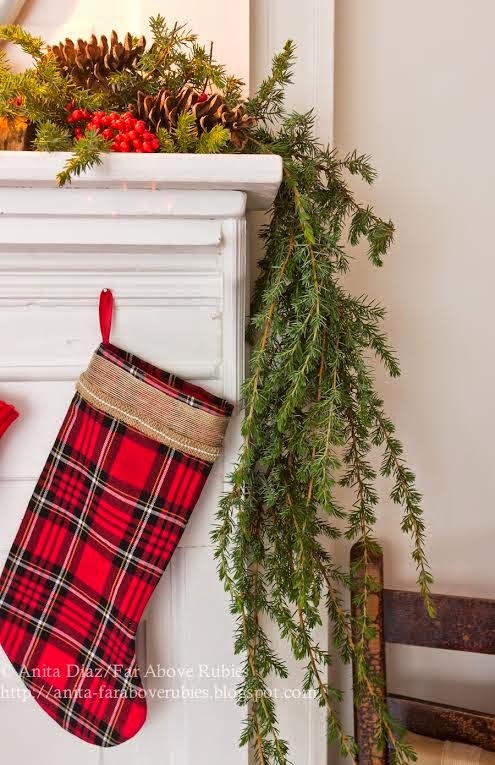 Linen and ticking Christmas stockings by Ann hang with a snowy branch tucked in. 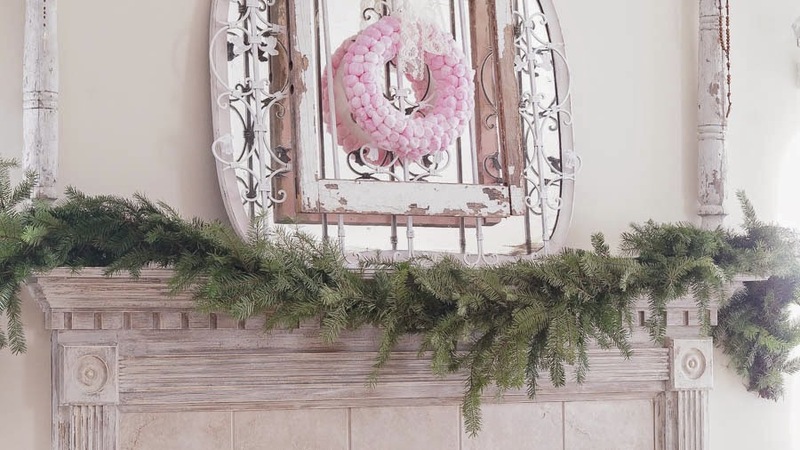 I hope you enjoyed my woodland mantel and now you will want to grab you something to drink and take the time to enjoy the rest of these gals' creative mantels. Just click the links below. Uh, yes, you "know" I keep tweaking! 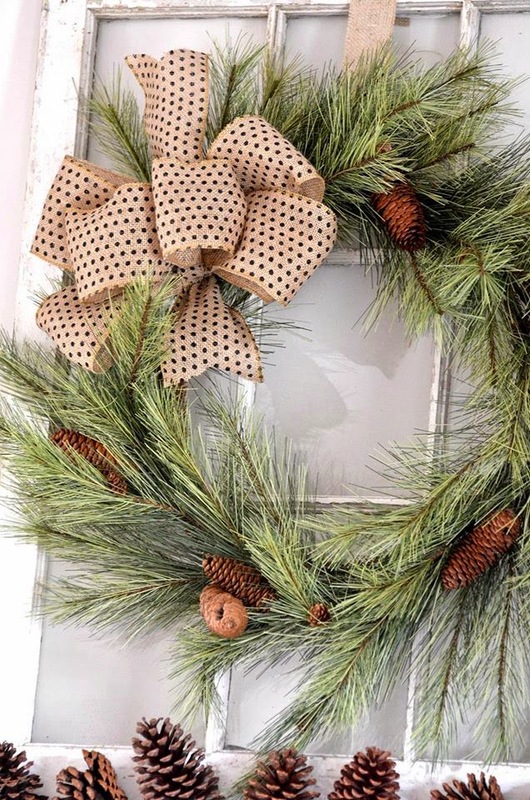 Love your "woodsy" mantel ... perfect snow, trees and deer! I "have" to find battery operated lights with a timer! Trees are from Pottery Barn and I got the smaller ones. I LOVE your mantel, Kim!! It has such a wintry and cozy feel. I'm a tweaker for sure...I just can't help myself. Love that mantel...and it is so in keeping with that gorgeous painting over the mantel....as I gaze at your beautiful mantelscape, I realized that I forgot to turn my garland lights on!.... :) ... love the trees and the snowy theme! Lovely mantle Kim-the bears are my favorite part! So pretty Kim! I love the snowy look to the theme that you've set! Your woodland mantel is beautiful Kim. Love the deer. Kim I love your mantel! I have those same lights. I hated paying $9 each for them since i have four sets but they are perfect with the timers. The logs and then the lights you added to them are perfect! 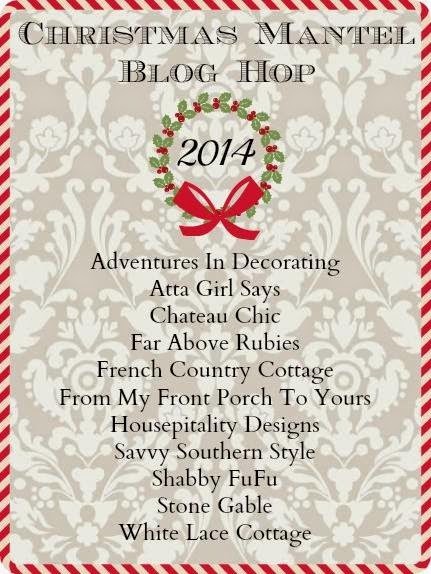 Thank you for joining the blog hop. Happy holidays my friend! Love the theme Kim, in fact I did a woodland creature mantel this year too and also have the white birch logs in my decor, great minds think alike. Those deer are just beautiful and that one looks so lifelike! Kim, I adore your woodland themed mantel, and the deer are my favorite! I was not aware that some of the battery operated lights came with timers! The snow on the top of the mantel creates a perfect scene! I loved your "woodland" mantel! The snow, the dog picture, the deer, the greenery...it is all lovely! Very well done! So cozy! 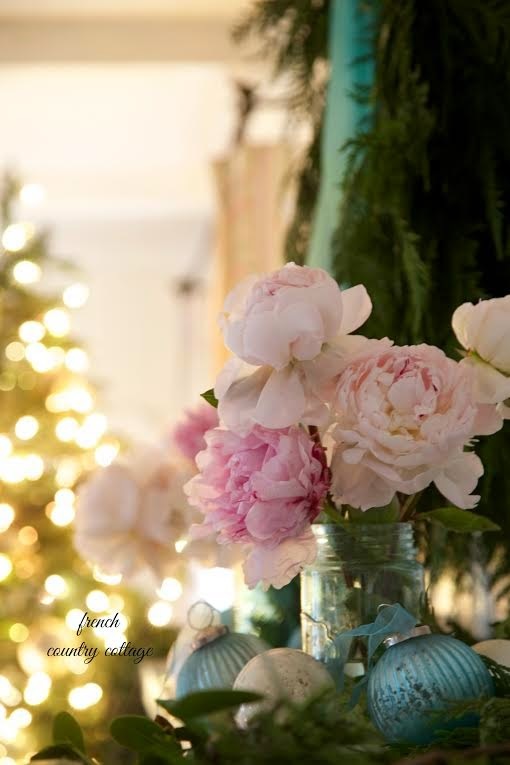 Une décoration de Noël très séduisante... Vous avez crée une très belle atmosphère. Love, love, love the deer! I really wanted to find some vintage deer, but didn't look soon enough. 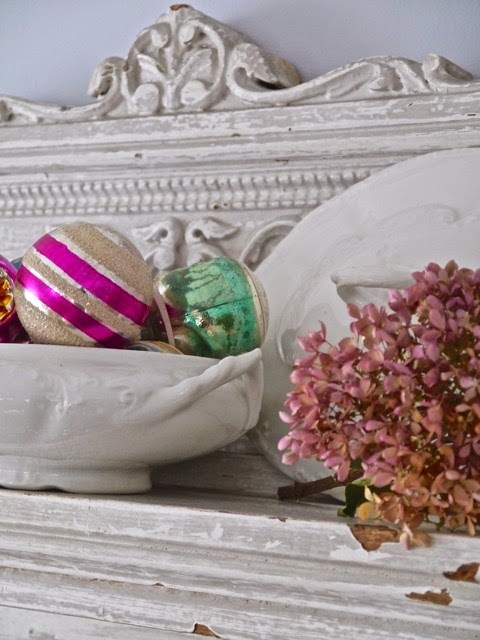 Your mantle is so beautiful with such a pretty and serene winter scene! Now, I could have sent you some birch logs! Love your theme Kim! Those bears are adorable! Love your birch logs,I found a set last year after Christmas they were pretty cheap.I am going to keep them out for the winter.They are in my dining room.Yes I keep tweaking too LOL.My rooms look a little different already since the photos because I am changing things around. I want to come steal those deer!! Your mantel is wonderful!! Soo cute Kim!! 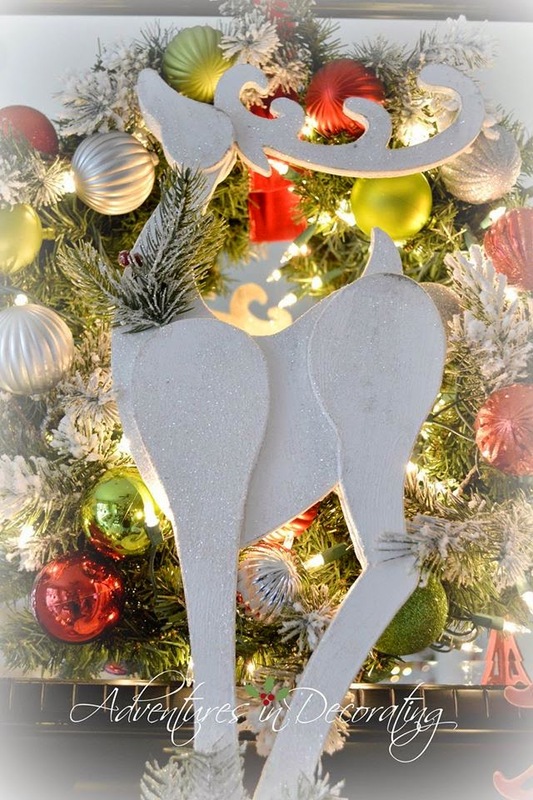 I have been adding a couple deer here and there as well- they are perfect for Christmas vignettes!! Looks beautiful, Kim! Love those lighted trees! I recognized those stockings from Ann right away...her stuff is so beautiful. Great job, as always! As usual with everything you touch, you mantel is beautiful. Beautiful mantel, Kim! Love the trees and deer oh, and the lights on the birch logs. Perfect wintry scene! I love a winter wonderland and just created another one in our bay window this year. Those trees are fantastic....I wish that I had a few! 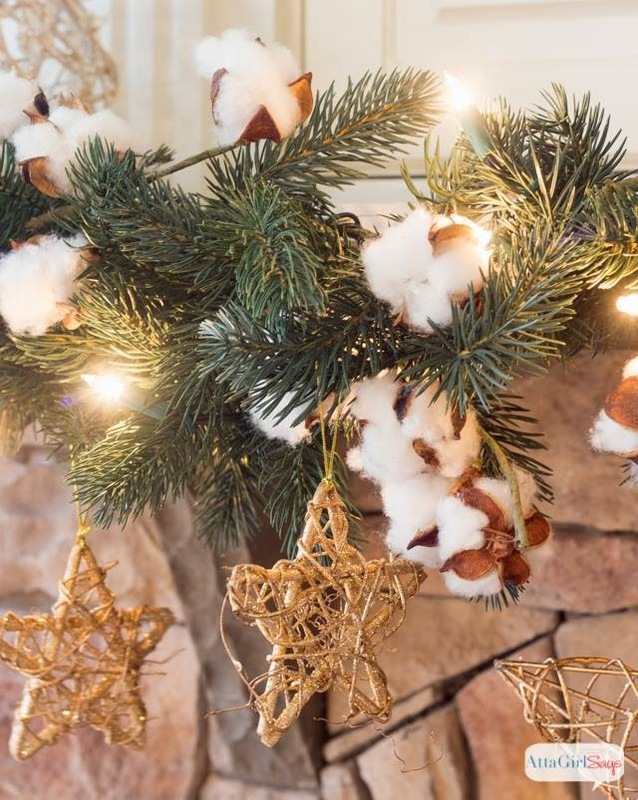 Enjoy the beauty of your Holiday decor! Your mantel looks so cute with all the woodland animals and snow on it. I really like your grain sack stockings too. My most favorite way to decorate the mantel and for Christmas. The rustic, woodsey way :) Great job! Kim love this. Your sweet little bears just made me smile. Too adorable. Always tweaking!!!! Love the lights on the logs. I just bought a little cute shirt for my granddaughter that says my favorite color is SPARKLE!!! We all need a little sparkle in our color schemes. Have a great week ahead. I just bought birch logs too!!! I love how you tucked the greenery into the stockings. All so pretty! Beautiful, Kim!!! I love the woodsy scene especially with that painting! I posted my mantle today. Hope you'll stop over. That deer really does look life like and a buck would have been awesome!!! It's perfect! I really like the lights on the logs. It rather gives the illusion of icy sparks from an ice fire, if such a thing actually existed. I love the idea of the blanket of snow on the mantel and the lit trees make it all magical. pretty mantel. I love the softness and woodland feel. 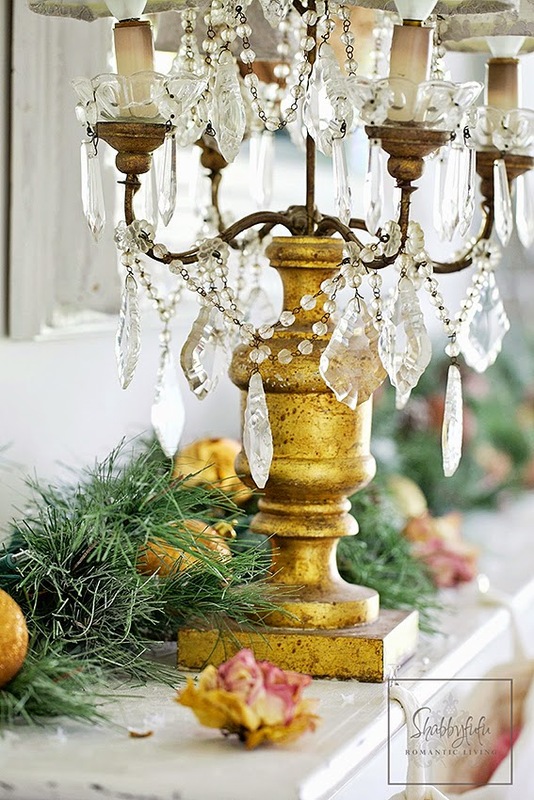 Beautiful mantel ! Love the trees and the deer! Love your woodland mantle Kim! Your mantel looks beautiful Kim! Kim I adore your Woodland Mantel. It is so perfect and everythings works together beautifully, love the dears and you have reminded me to get more birch logs! Karena, it is Wilson Evergreens. They sell on Amazon, too, but the shipping is way less on etsy. Love your mantel Kim....The lights on the logs are great! This is so lovely Kim...those deer are wonderful. I looked for some this year but was too late and they were all gone. I never thought to look at my antique mall. Thank you for the tip...and thank you for the link as well. Merry Christmas! A serene and snowy Christmas scene! Beautifully peaceful. It's beautiful, Kim! I really like that it is so different than most mantel decor I've seen -- it really feels like you brought some of the outdoors inside! Don't know how I missed this post Kim?? 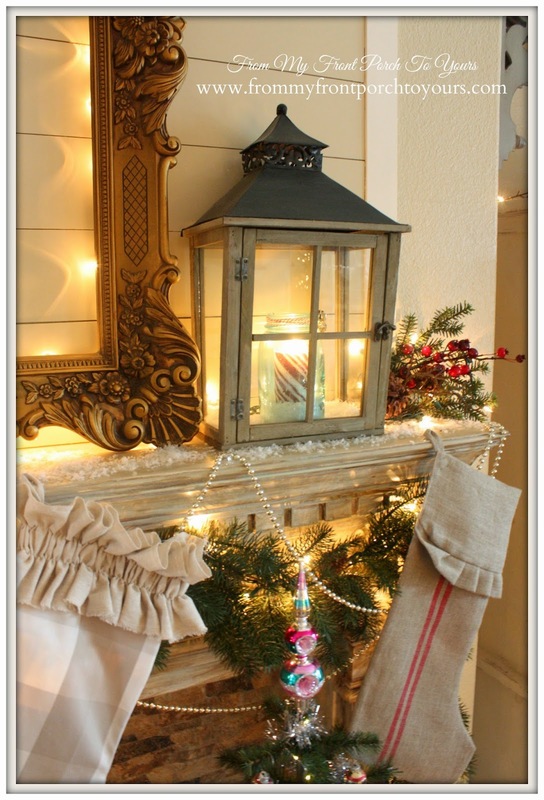 Love your in the woods themed mantel and I love those little lights wrapped around the logs...very cute! Your mantel looks fabulous! What I love most of all is that your vignette can stay up all Winter long. Such a peaceful and Wintery look. I love the big trees on the ends....Pottery Barn? I think I will be adding a couple of those plus some deer (if I can find some online) to my already snowman mantel! That will take care of the Winter season. Thanks for sharing. The woodland mantel is lovely, Kim and is a great choice with your dogs art. As soon as I saw the pretty stockings I wondered if Ann had made them.